I'm not sure why that might be happening. What version of Java are you using? Please see if you can install Java 6: http://www.thebrain.com/java and let us know if that fixes it for you. I downloaded and installed java 6 and I still could not run PB4. Is there anyone out there successfully running PB4 on win98? OK. I think we have identified the problem based on the output in the error log. We've made a change that should avoid this issue in the next release, which we will post later this week. Thanks for your help. Thank you for the the effort to get PB4 to run on Win98 since I know that many companies that are updating their software packages no longer care if they run on win98. This last update no longer outputs any errors in the log but, at least on my computer, when the program is run all I get is the "about" flash screen which then freezes, and I have to use ctrl-alt-delete to terminate the program. Again, is there anyone running win98 that is getting this same result? Or, are you getting PB4 to run properly on your system? It has been awhile since my last post to this thread. However, I am still not able to get PB4 to run on my win 98 based system, inspite of the supposed "fix" that was implimented in an earlier version. And since then I have had acess to another win 98 based system which reacts the exact same way that I described in my last post to this thread. 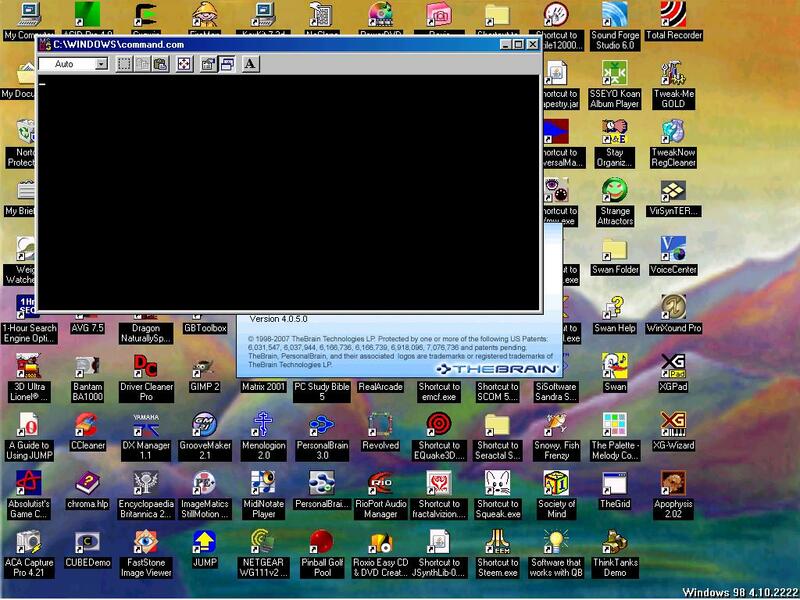 For further clarification--with the hope that I might get someone to confirm or refute my notion that PB4 at this point in time does not indeed run on a win 98 system--I have included two consecutive desktop images showing what happens at startup of PB4 just before the program freezes as shown in the second attached image. Even though there are no errors reported, this at least shows that the program started up. I hope this will help to at least determine if there is still a possibillity, or not, of getting PB4 to run on win 98. We've made another change that hopefully will resolve this issue. This will be included in 4.0.5.2. Thanks. Thank You very much for your support in helping me to get PB4 to run on Win98. I am finally able to use the program on two different Win98 systems. Most of the functions of the program that I am interested in using are working properly, as far as I can tell. Also, I get the same error when I try to use "Open in Browser" in the notes pane. This happens consistantly in both Win 98 systems that I currently have access to. At the present time the only way that I can open an attachment is to use right click: "Open Attachment With..."
I hope there is an easy way to fix this. Is there anyone else beta testing PB4 using Win 98? We'll take a look at this and see if we can solve it. I'm not sure offhand. Yes, I am still testing PB4 on win98 although my main system is winXP now. Since my last post a new issue has come up relating to the new attachment indexing libraries. Also, since the issues that I brought up in the the May 29th post are still present in the latest releases, I am assuming that you were not able to resolve them. Is this correct? For what it's worth, D&D from either Outlook 97 or Outlook Express 6 doesn't work in win98 either. 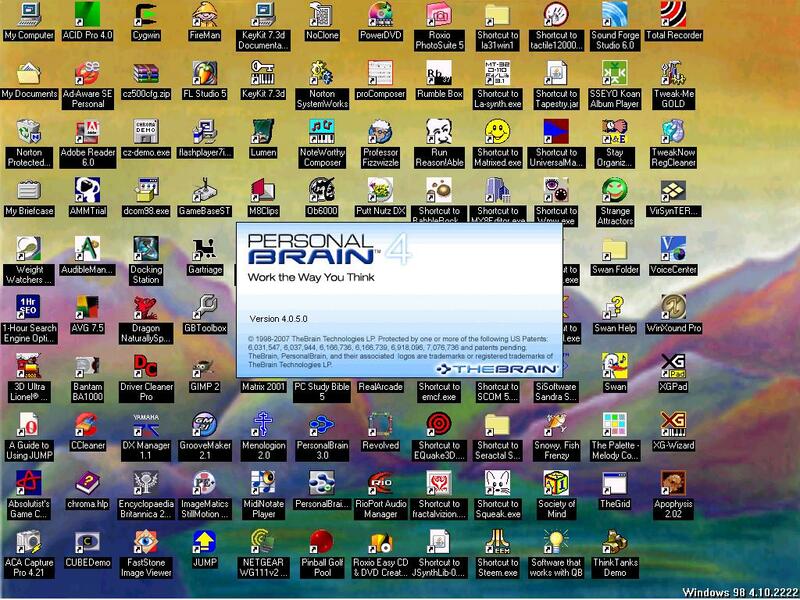 Unfortunately we were not able to find a solution to opening attachments in Windows 98 from PersonalBrain. Also, the indexing libraries are not designed to run under Windows 98... To roll back and remove the indexing libraries, delete the folder PersonalBrain\bin\filter. Sorry, but 98 is just getting too old - it is very hard to find any information on it these days.